This tutorial will guide you to reallocate disk space on Windows Server 2008 with professional partition software instead of repartitioning hard disk. Download IM-Magic Partition Resizer Server to reallocate disk space without repartitioning hard disk on Windows Server 2008. 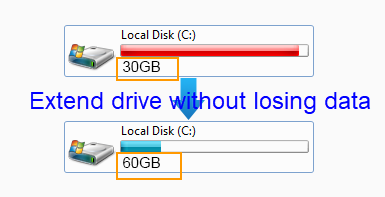 You can allocate disk space for each partition when dividing a hard disk on computer. If you need to reallocate disk space after dividing a hard disk, you may need to repartition the hard disk. Now, with IM-Magic Partition Resizer Server, you can reallocate disk space easily without repartitioning the hard disk. This partition software allows you to reallocate disk space by moving free space from one partition to another. By using this software, you can resize disk partition Windows server 2008 without touching any data or hurting the operating system. The partition software supports all Windows Servers. You should move the unallocated space close to the partition that has insufficient space. 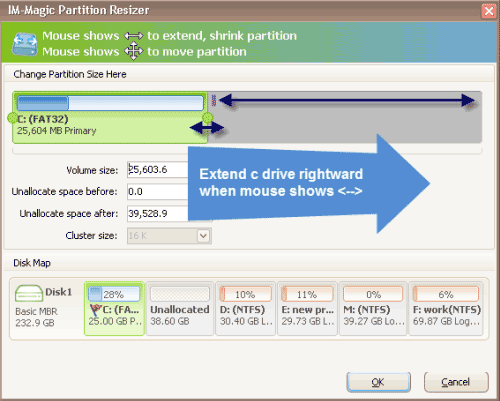 Then, right click this partition and choose "Resize/Move". "Today, I find that the system partition is running out of disk space when I want to install a program on this partition. I download a program and want to install it on my computer. However, Windows reports a message say that the selected partition does not have enough free space for installing the program. Checking the Properties of the system partition, there is only 200MB free space left. The program I want to install on my computer has about 2GB size. What can I do if I want to install the program?" "I have Windows Server 2008 in VMware, but I meet a problem that the C drive is running onlow disk space in VMware. I tried free up space and uninstall some unnecessary applications, but system still pops up low disk space warning on the C drive. Can I increase the size of C drive without reinstalling Windows Server 2008 system?" How to Redistributing Disk Space on Windows Server 2008? When running into low disk space problem, the most effective way to resolve the problem thoroughly is to reallocate disk space. That is to say, you can redistribute disk space when disk partition is running on low disk space. Here are some possible ways to redistribute disk space on Windows Server 2008. Here, the partition software can provide the most effective and easiest way to perform partition resizing. Simply, you can run the software and shrink a partition that has enough free space and squeeze some unallocated space. Then, you can move the unallocated space close to the partition that low disk space and add the unallocated space to this partition. You can extend C drive system partition on Windows Server, and you can also resize data volume without touching any data. Why Do You Need to Reallocate Disk Space?